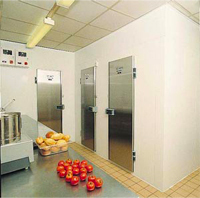 We specialise in cold rooms. Off the shelf standard sizes, or custom built to any shape or size that you may require. The condensing units can either be built into one of the cold room walls. Or outdoors on a flat roof or wall brackets. There will be no problem with noise as they are very quiet. The picture below shows a dual compartment cold room that we have just completed in a government research establishment. All of our equipment is installed by Brass Monkey's fully qualified engineers. To make sure your equipment continues to work to an optimum level, we have full maintenance programs and a breakdown service.